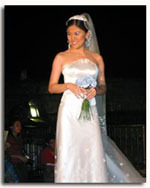 As Intramuros Administrator Dominador Ferrer remarked, the Walled City has long been a venue for weddings with its many churches - a tradition that has disappeared with the destruction of the city in World War II. This year, with all the initiatives of the Department of Tourism to revive its glory, Intramuros is now the hub of all cultural activities. 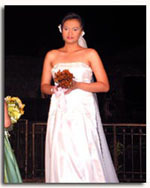 Last November 22-23, it also served as the culmination venue of the 10-city Bridal Fair Road Show, Kasalang Filipino. 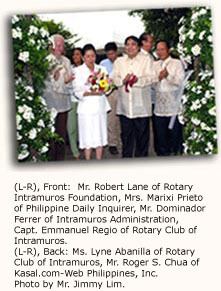 Mrs. Marixi Prieto of the Philippine Daily Inquirer, being one of the event Co-Presentors, led the ribbon cutting, together with the Chair of the Rotary Intramuros Foundation (Mr. Robert Lane), the President of the Rotary Club of Intramuros (Capt. Emmanuel Regio), the Intramuros Administrator (Mr. Dominador Ferrer) and the President of Kasal.com-Web Philippines, Inc. (Mr. Roger Chua). 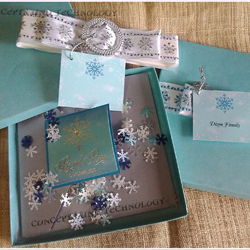 1st 100 couples-to-be who attended were given special gift packs and surprise stubs from Fuji Film YKL. 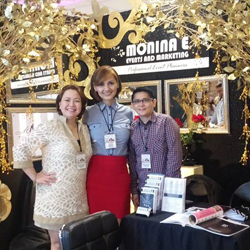 Guests were serenaded by Leggiero Strings and Agape Strings as they visit each booth. Patio Victoria and VS&F made available good, affordable meals so guests can partake their lunch and snacks and even dinner within the venue. 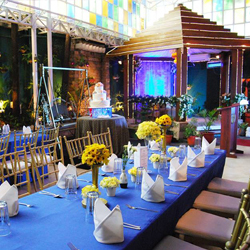 Elaborate setups by Patio Victoria,VS&F, Hizon's, Josiah's,JuanCarlo, Swan's, Robert Camba,provided the perfect backdrop tothe dining areas. The afternoon goers were treated to a make over demonstration by VMV HypoAllergenics through make up artist, Babette Piguerra. 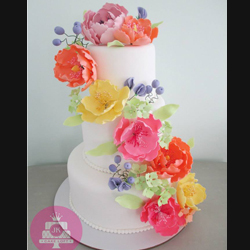 The afternoon continued with fun as Goldilocks Bakeshop invited several couples to a sweet, thoughtful game - couples were entwined as they race to finish a slice of cake! 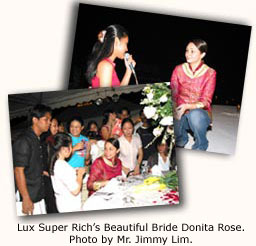 From a gloomy morning, the afternoon was transformed to a radiant beauty as Lux Super Rich's Beautiful Bride, Ms. Donita Rose, visited the event and shared her love story, her wedding preparations, as well as her beauty secrets to the guests. 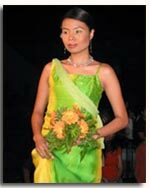 The first night was capped with an enchanting fashion show by the Sari-Sari Group of Companies and Ms. Michelle Lim, with guest celebrity models, Ms. Amy Perez and Ms. Nina Ricci Alagao. 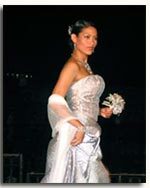 Sari-Sari quest celeberity, model, Ms.Amy Perez, in one of Sari-Sari's bridal collection. 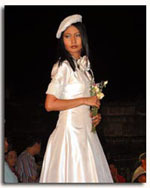 Sari-Sari guest celebrity model, Ms.Nina Ricci Alagao, in one of Sari-Sari's bridal collection. The 2nd day provided fair goers with equally exciting but different treats. The Nivea Body Game took the inhibitions off several couples-to-be, as attendees watched which pair can manage to stay entwined the longest. Philam Life raffled off prizes during the afternoon break as couples-to-be prepared for the Dove Discovery Game. 10 couples-to-be were invited by Dove to learn what the guys have discovered about their brides-to-be. 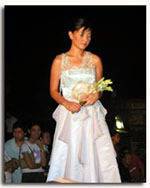 The lucky couple-to-be was given a P60,000.00 worth of Dove bridal shower package! More prizes from The Leather Collection, Pearl of the Pacific, 357 Boracay were given off during the late afternoon, immediately following the announcement of Kasalang Filipino Photo Contest Winners. 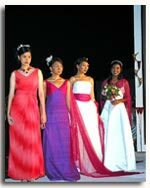 The event finale sizzled with an intimate apparel show by Ms. Shirley Duque Alejandrino, back-to-back with a bridal fashion show by Theresa Tan, Mitzi Quilendrino, Millet Guinto and Zandra Lim. Truly, the fabled City of Intramuros is the perfect setting for the fair. As Capt. Regio shared, the cultural grandeur of the ancient walls, the richness of its history and the vibrance of its business and commercial community all combine to provide a storied ambiance to this event. Sari-Sari Group of Companies, Inc.
Wings of Dreams Enterprise, Inc.